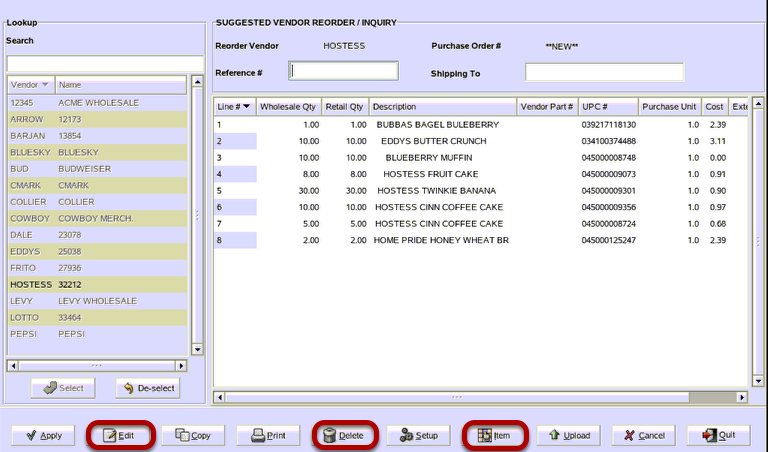 TravStar1 Point Of Sale SystemManager's Work Station Inventory ControlHow Do I Place an Order for a Vendor Manually? How Do I Place an Order for a Vendor Manually? 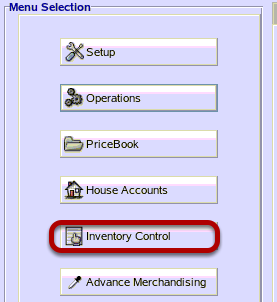 From the Main Menu, click on "Inventory Control". 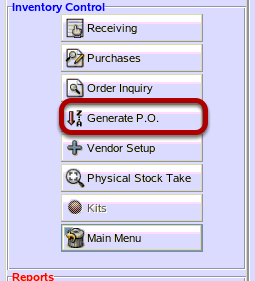 From Inventory Control, click "Generate P.O." 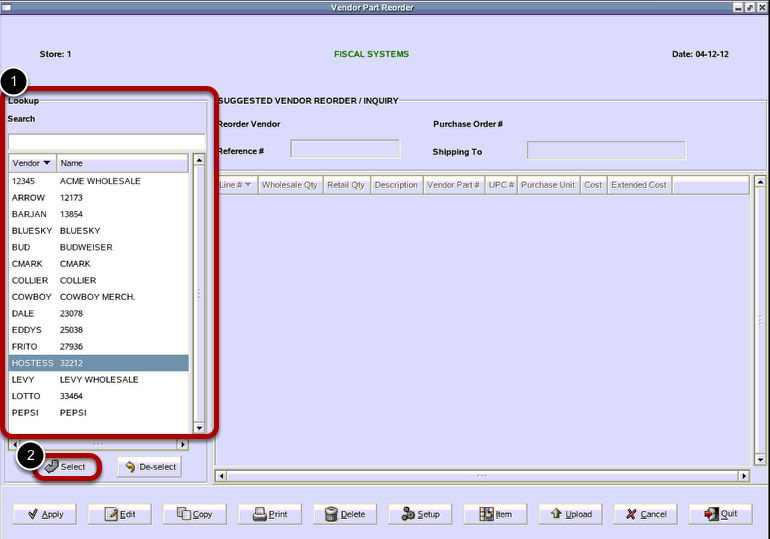 (1) Use the up and down arrow or the search bar to highlight the vendor you want to make an order for. (2) Click on the "Select"button. Click the bubble beside Manual P.O. then click on the "OK" button. This is an item list of each item by vendor you have chosen. Select each item you would like to order, then click "Add" button. Type in the desired quantity to order and then click on the "OK" button. The item is added into the background to your Purchase Order screen. When you are finished adding all items to the purchase order, click on the "Cancel" button. To make any changes to the suggested reorder quantities, use the "Edit" button. 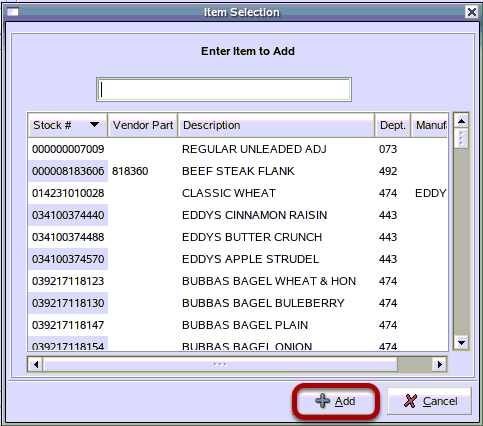 To remove an item from the reorder list, highlight the item and click on the "Delete" button. To add a new item to the list, click on the "Item"button. Once all changes have been made, click on the "Apply" button. To print the order as a report click on the "Yes" button. Otherwise, click on the "No" button. 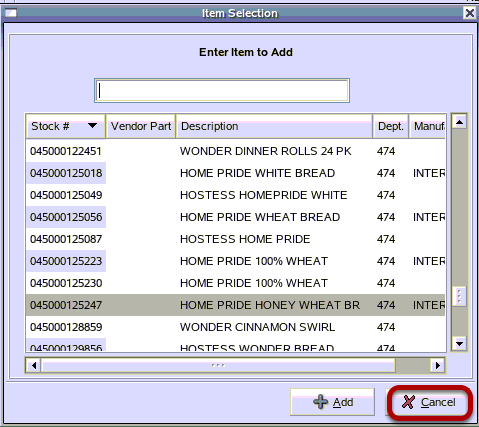 To sort the online report by stock order # click on the "No" button. This is a sample of the Purchase Order Report. Note your PO # in the upper right corner. Prev: How Do I Place an Order by Min and Max? 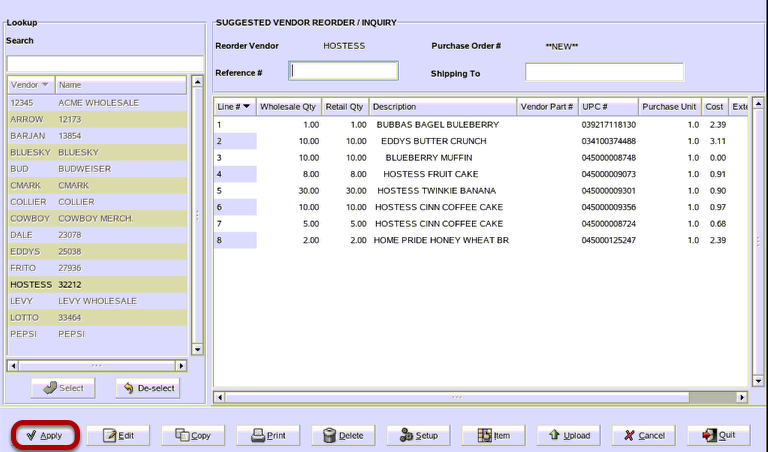 Next: How Do I Turn an Existing Purchase Order into an Invoice?